Kemal Atatürk (1881-1938),Turkeys national hero,was a military commander of genius and a statesman with few equals. If you visit Turkey youll want to know at least the basics about Atatürk because his image is everywhere and his influence is still alive generations after his death(in 1938). What did he do? He took a defeated, demoralized, poverty-stricken medieval theocratic monarchy and reshaped it into a vibrant, progressive, democratic secular republic. In other words, he turned black into white almost single-handedly. A boy named Mustafa was born into the family of a minor official in Ottoman Salonika (Thessaloniki) in 1881. Excelling at mathematics in school, his teacher gave him the nickname Kemal(Excellent).He went on to attend the Ottoman military staff college (Harbiye) inIstanbul. He joined other “Young Turks” to reform Turkeys government and society in the last years of the 19th century. Unfortunately, it was his far less talented colleagues who took power from the sultan and led the empire into a disastrous alliance with the German Empire during World War I. 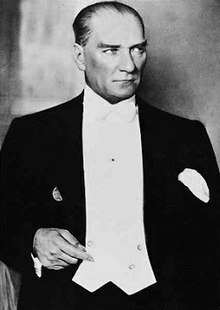 During the Gallipoli campaign (1915-1916),Lieutenant-Colonel Mustafa Kemal was instrumental in stopping the advance of the Allied forces intent on seizing Istanbul. He commanded from the front lines with incredible courage, and was hailed as a war hero. After the war, the Allies tried to seize most of Turkeys territory and resources, leaving little for the Turks. Kemal fled from occupied Istanbul to Anatolia and rallied the population in defense of their homeland. He summoned representatives,organized a republican government and army and, while serving as head of goverment also commanded the army against several powerful invading forces. By 1923 the republican armies had driven all the invaders out, and the new government in Ankara was secure—if poverty-stricken. Granted the surname Atatürk (Father of the Turks) by a grateful parliament,Kemal made peace—and even established friendly relations—with Turkeys erstwhile enemies. Before his untimely death in 1938, he spearheaded his countrys economic recovery and laid the foundations for Turkeys neutrality in World War II. It may well be said that without Atatürk, there would be no modern Turkish Republic, well ahead of its Islamic neighbors in democratic, social, cultural and commercial progress. Atatürks memory and legacy are revered and protected by law. Nobody in Turkey jokes about Atatürk. During your visit, refrain from any light-hearted or disrespectful references to the national hero.